I like yoga. I like how it calms the mind, improves concentration, increases flexibility and makes me feel like I can conquer the world. 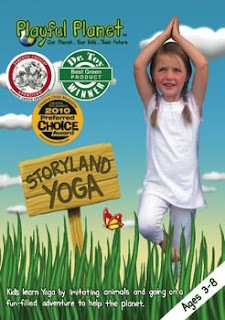 So, I looked forward to reviewing Storyland Yoga by Playful Planet. This is a multiple award winning yoga program (2010 Parent Choice Approved, Dr. Toy "Best Green Product, And Preferred Choice from Creative Child Magazine) designed for little ones (ages 3-8) in mind. The video features certified yoga instructor, Ahmed Fahmy, who takes children on two fun-filled adventures. The two stories engage children's imaginations while learning yoga poses while becoming part of the story and imitating animals. We broke the video out today and really enjoyed it. The instructor, Ahmed, has a delightful personality and a gift at telling stories. My girls were completely engaged with the story and loved his animated voice and animal sounds. The postures were not difficult and they were eager to do them all. The stories were adventurous and encouraged children to use their imaginations. each story was about 20 minutes, which seemed to be an appropriate time. The DVD suggests you use this as a regular yoga class (love this idea) and also suggests you use this as a playdate activity with friends. I think this is a wonderful suggestion and can easily picture some of the girl's friends, boys included, enjoying this DVD. It was really more like a game for them with all the added benefits of yoga. To learn more about Playful Planet, please visit their website at http://www.playfulplanet.com/. My readers have a chance to win a Playful Planet Storyland Yoga DVD. Giveaway open to residents of the US only. You must leave a way for me to get in touch with you in your entry. A winner will be selected using Random.org. Winner will be notified by email and must respond within 3 days or another winner will be chosen. Giveaway ends on December 15, 2010 at 11:59pm. Disclosure: Thanks to Playful Planet for providing me with the opportunity to review this DVD and offer this giveaway item. This review contains my honest opinions. I was not compensated in any manner except for the review product. Ann Crabs reviews/author assume no liability for damages associated with any prizes awarded here or contents contained therein. Prizes lost in the mail or those not delivered by sponsors are not the responsibility of Ann Crabs.. Giveaway sponsors are responsible for shipping prizes that are offered on Ann Crabs. Please allow 2-4 weeks for delivery of any prizes won. If you do not receive your item AFTER that time, please email me and I will follow up with them. Its an appreciating move where kids can learn yoga by watching Yoga DVD or video.It would be fun and fitness for the kids. I I entered the Rock N learn Money giveaway! I publicly friend you on GFC. I follow playful planet on twitter. I entered your RockNLearn giveaway. Entered the Rock n Learn giveaway! I would LOVE to win this for my 2 year old! We could do yoga together! Do I get an entry for letting you know the PlayfulPlanet twitter link isn't working? I was gonna follow :) Otherwise, please just delete this comment, I'm not trying to be cheeky or cheat but fyi on the link!